Useful for Home, Office, PC and Car. Bizinto 41 in 1 Pieces Tool Kit and Screwdriver Set , UV_HT_06 is a premium quality Screwdriver Sets from Bizinto. 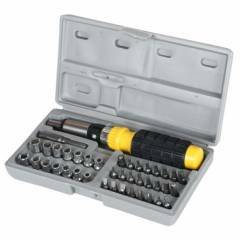 Moglix is a well-known ecommerce platform for qualitative range of Screwdriver Sets. All Bizinto 41 in 1 Pieces Tool Kit and Screwdriver Set , UV_HT_06 are manufactured by using quality assured material and advanced techniques, which make them up to the standard in this highly challenging field. The materials utilized to manufacture Bizinto 41 in 1 Pieces Tool Kit and Screwdriver Set , UV_HT_06, are sourced from the most reliable and official Screwdriver Sets vendors, chosen after performing detailed market surveys. Thus, Bizinto products are widely acknowledged in the market for their high quality. We are dedicatedly involved in providing an excellent quality array of Bizinto Screwdriver Sets. The pricing for this amazing toolkit is moderate. The quality of the metal is good.Highly recommended if you are on a super tight budget. 2 of 5 users found this review helpful. Was this review helpful? last week I purchased Bizinto 41 in 1 Pieces tool kit. Very useful multiple toolkit at very handsome prices. good quality ,easy use,good product for home use at low price. Buying this product fromm local market is very costly as compared to moglix online store and also delivered in very quick time.